Characteristics, History: Karnak Temple of Amon-Ra. The New Kingdom witnessed the appearance of the large Egyptian temples - the most impressive form of Ancient Egyptian architecture after the Old Kingdom's pyramids. There are two types of sanctuary: a mortuary temple on the west bank and a temple to the living god on the east bank of the Nile. 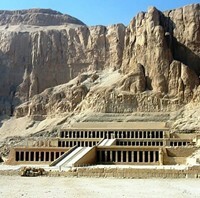 The largest group of temples is at modern Luxor (ancient Thebes). The basic temple plan was an approach avenue, often lined by sphinxes, leading to two great entrance pylons (usually with two obelisks, emblems of the sun, before them); next an open court, a hypostyle (columned) hall and last, the sanctuaries. This plan could be elaborated by the addition of further courts, halls or colonnades. Only high officials were allowed beyond the great outer court. Two of the best preserved Egyptian temples, both of the Ptolemaic period (304-30 BCE), at Dendera and Edfu, are dedicated to the goddess Hathor and the god Horus respectively. Following the collapse of order at the end of the Middle Kingdom the "Hyksos," mercenary leaders from the Near East, established themselves in the east Delta and gradually extended their rule to Memphis and Middle Egypt during the 2nd Intermediate Period (1650-1550). Upper Egypt remained virtually untouched by the invaders. It was again the princes of Thebes who had to expel the foreigners and found a new united kingdom, thus preparing the way for the most brilliant era of Egyptian civilization. By pursuing the Hyksos into their Palestinian homeland, and by other conquests in the north and in the south, deep into the Sudan, there arose a powerful Egyptian empire that lasted, with Thebes as its capital and religious centre, for two hundred years. One of the prerequisites of this renaissance was a renewal of the conception of kingship. According to the new official dogma the legitimate ruler was begotten by the god Amon-Ra and the sister-consort, now exalted to "consort of the god," of the ruling king. In death the ruler entered into the being of his divine father Amon. At the beginning of the New Kingdom Thebes was still a young city whose historical traditions did not extend beyond the local nomarchs, from whom Neb-hepet-ra Mentuhotep, founder of the Middle Kingdom, had stemmed. The new capital had to establish its visible supremacy through the superiority of its system of gods and a display of monumental sanctuaries. In the Middle Kingdom Thebes had become the adode of Amon, the creator god, who, by appropriating nearby cults such as that of the primeval fertility god Min of Coptos and finally the sun god Ra of Heliopolis, had developed into a universal divinity and "king of the gods." The military victories had been won in Amon's name and into his sanctuaries streamed most of the booty, and the tributes of the conquered peoples. Amon-Ra became the national deity. He acquired the Theban goddess Mut as his consort and the moon god Khonsu as their son. From now on this family of gods formed a triad, with coordinated sanctuaries at Karnak. Each member of the triad possessed near his cult image a sacred barge, and in these the images could be taken to visit one another within Thebes. Apart from these principal Theban gods, the cults of other important deities, such as Ptah of Memphis, had already found their way to Thebes during the Middle Kingdom; these sanctuaries were also expanded under the New Kingdom rulers. The active construction of temples for the gods and of royal mortuary temples began immediately under the first kings of the Eighteenth Dynasty, and it aimed at giving monumental expression to the various theological systems newly drawn together; their arrangement turned the entire area of Thebes into "Amon's city." The district of the capital city of Thebes extended along both banks of the Nile. On the east bank stood the royal palaces, with the government buildings and residential quarters between the boundaries of the principal sanctuary of Karnak on the north and the sanctuary of Luxor on the south, both dating from the Middle Kingdom. On the edge of the west bank, confined by its cliffs, lay the necropolis, which had as its first monumental centre the tomb complex of the founder of the Middle Kingdom in the valley at Deir el Bahari. Here lie buried also the kings of the New Kingdom, but for reasons of security the royal tombs were tunneled into the rock in the lonely Valley of the Kings in the western hills, physically separated from the temples for the worship of the dead. The royal mortuary temples were ranged at the foot of the cliffs that run in a line north and south, facing the fertile land and the sanctuaries on the east bank: they were memorial temples in the true sense of the word, serving not only for the cult of the king and his followers but also for the worship of Amon-Ra and other gods. Also on the west bank, further to the south and beyond the limits of the original city there has been found a "primeval hill" that was probably already extant in the Middle Kingdom. The sanctuaries of the gods of Thebes were certainly independent buildings that were erected for specific reasons and especially in connection with jubilee festivals as "memorials of the kings for their father Amon," but their planning played an important role for the neighboring cults. The remains of the oldest sanctuary of Karnak, rebuilt in the Twelfth Dynasty, are so scanty that the ground plan can no longer be established with certainty. It formed the core of all later expansions. Its east-west orientation was determined by the Nile from which a canal probably led to the forecourt of the temple at an early date. Because the temple was expanded continually toward the west the landing place, with its small obelisks and an avenue of ram-sphinxes leading to the later main entrance of the sanctuary, was likewise shifted westward, and its existing remains date only from late in the New Kingdom. The history of the sanctuary is complicated by repeated expansions and by razing old shrines and constructing new ones, in the principal east-west directions and toward neighbouring cults on north and south, a process that lasted from the beginning of the New Kingdom into the Late Period. Only traces are left of many of the buildings. Accordingly we can only discuss the basic conception of the architectural layout with reference to the more important elements of the temple, and describe the most notable sites. So many cults gathered around the main temple of Amon-Ra, the king of the gods, that Karnak had the name "Collector of Holy Places." The decisive influence on planning during the Eighteenth Dynasty was Amon's taking over of the essence of the sun god. The connection with the Heliopolitan place of worship of Ra, with its pylons, obelisks, and wide courts, was thus supplied by the essence of the national deity. King Tuthmosis I was responsible for a considerable widening of the boundaries of the Middle Kingdom sanctuary, which he enclosed with stone walls on north, south, and east; on the west, toward the Nile, he built two monumental portals in close succession, between gate towers. Inside the giant court, against the enclosure walls, he set up statues in the form of Osiris, symbolizing the perpetual renewal of the kingship within the dynastic order: here began the furnishing of buildings with a form of stone sculpture closely associated with the architecture. On either side of the gateway in the broader and taller front pylon (present pylon IV) Tuthmosis I erected sixty-five-foot obelisks of rose granite, of which the southern one still stands. Between the two pylons (IV and V) was inserted a splendid hall with papyrus bundle columns and colossal standing figures of the king. The central precinct of the temple was thus permanently fixed. Here, within the zone of the Middle Kingdom sanctuary, Queen Hatshepsut built a red quartzite chamber for the processional barge and the cult image of the national god. Open to east and west, it was flanked by subsidiary chambers for religious implements. In the narrow court intervening between her father's pylons (IV and V) the queen raised two obelisks almost one hundred feet high, of which the northern one still stands. At the same time she took in hand the south axis, that led from the forecourt in front of pylon IV to the temple of Mut and thence to the sanctuary of Luxor, and built pylon VIII, placing before it enthroned statues of colossal size. Her successor, Tuthmosis III, replaced the queen's red quartzite shrine with a new one in rose granite and in front of it he erected a small pylon (VI) as the entrance to his "hall of annals"; the ceiling rested on two slender square pillars decorated in painted high relief with the heraldic plants of Lower and Upper Egypt, the papyrus on the north pillar and the so-called lily on the south. In the hall of annals the conqueror recorded the details of his victorious campaigns against Palestine and Syria. Finally, Tuthmosis III erected two larger obelisks in front of the pair built by Tuthmosis I, but these have not survived. The area enclosed by Tuthmosis I was extendend to the east by Tuthmosis III when he added a self-contained temple whose principal element was the great "festival hall" for the celebration of the king's jubilee. It consists of a court laid out at right angles to the main axis of the temple and ringed beyond by entrance halls supported on square pillars. In the middle of the eastern wall of the hall of columns lies the entrance to the holy of holies, which extends toward the east. Into this hall the king introduced two rows of tall columns, bearing a flat roof that is higher than the roofs of the surrounding halls; between the necessary supports the zone remained open, so that the interior suggests in cross section the appearance of a "basilica" with a clerestory. The orientation of the building, the mode of construction, and the form of the columns lining the central aisle, which resemble stone "tent poles," reveal that here two elements, a court with a festival tent erected in it, have been skillfully combined. Against the outside of the east wall of this jubilee hall the king built a small sanctuary facing east, and in front of it he erected a huge single obelisk, now standing before the Lateran Palace in Rome. Tuthmosis III also developed the south axis of the temple, adding another pylon (VII) with colossal statues of the king on the south side. On the east side of the court formed between pylons VII and VIII he erected a small repository chapel that also leads to the "sacred lake" of the Karnak area. Sacred lakes were permanent features of Egyptian temples. They were the source of the holy water used in the ritual and, on festival occasions, the scene of excursions of the sacred barge. Along the banks there were also enclosures with birds flying about in them, later to be used in ritual sacrifice. The pylons further along the south axis (IX and X) were built at the end of the Eighteenth Dynasty, pylon X serving also as the monumental southern entrance to the temple precinct. An avenue of sphinxes led south from here to the nearby temple of the goddess Mut, partially surrounded by its own horseshoe-shaped sacred lake. The main temple was also enlarged westward, in the direction of the Nile, by the addition of further pylons. Sety I began the building of the great hypostyle hall at Karnak, in the courtyard between the pylons of Amenhotep III (III) and of Ramesses I (II); the enormous structure was completed by Ramesses II. It is of particular historical interest as the first true example of a building of the "basilica" type, that is, a long multi-aisled hall with a tall central aisle and much lower side aisles. The central aisle supports a ceiling on two rows of papyrus columns nearly eighty feet high with open bell-shaped blossoms as capitals. The two lower side areas containing the aisles have each sixty-one close-set papyrus-bundle columns forty feet high, of the smooth unified type introduced in the age of the Ramessides. The important clerestory zone between the roofs of nave and aisles consists of the supporting pillars and stone grilles between, which could have only dimly lighted the central aisle. The bands of inscriptions on the wall surfaces of this hall indicate that it served not as a real place of worship but as an assembly place for the sacred barges of the Theban triad at the time of processions. The barges were brought there from their sanctuaries "when Amon appeared at the festival to behold the beauty of the Theban region." Other "basilican" structures of this type, though on a much smaller scale, are found in the mortuary temple of Ramesses II (Ramesseum) on the west bank at Thebes, and the contemporary remains of the main temple of Ptah of Memphis. At right angles to the main axis of the temple were built repository chapels, large and small, that served as resting places for the sacred barge during the processions. Other individual temple buildings were on north or south according to their relationship to the neighbouring sanctuaries. The most important of these is the temple of the moon god Khonsu, child of Amon and Mut. It faces south toward the temple of Luxor, with which it was connected by an avenue of sphinxes well over a mile long. Its builder was Ramesses III. It is historically important for its good state of preservation and also for its systematic layout; in its succession of halls and their arrangements it continued to serve as a model until the temples of the Late Period. Passing through a portal between gate towers, one enters a court flanked by double porticoes. At the end of the court stands the temple porch at a slightly higher level. Next comes a broader hypostyle hall with a tall central aisle and lateral windows. The columns of the central aisle, like those of the great hypostyle hall at Karnak and the Ramesseum, have open papyrus blooms as capitals. Beyond this hall lies a square room with the barge chapel of the god in the middle. In the rear part of the temple is a broad low-pillared hall with chapels on three sides. These characteristic features, which were already prepared for in the Eighteenth Dynasty in the layout of the temple of Luxor, have been organized into a logical schema in the temple of Khonsu. From one chamber to the next the floors are slightly raised, the ceilings become lower in the same rhythm and the passages narrower. As one advances through the first pillared hall into the interior of the building the light becomes steadily dimmer, first admitted through lateral windows and then through mere slits in the roof. The sanctuary lies in total darkness; it hides with its cult image the "secret" of the temple. One of the great works of ancient art, the temple of Luxor, on the south side of Thebes like the principal sanctuary of Karnak, also goes back to the Middle Kingdom. Under Hatshepsut and Tuthmosis III a granite chapel stood there with well-proportioned papyrus-bundle columns, incorporated by Ramesses II with the great court he added on the north. The Luxor temple itself was the work of Amenhotep III and was built according to a uniform plan and on a much larger scale than the older sanctuary. It lies close to the Nile bank facing north and was the "southern harem" of Amon, who was worshipped here as the god of procreation. It thus had a particular significance for the king, whose divine conception and birth are represented in the "birth room" on the east side. Unequalled in Egyptian architecture is the lofty elongated passage, with its two rows of fifty-foot papyrus columns with open flowers for capitals, that leads into the great court of the temple. No pylon towers emphasized the entrance to this huge hall; no side aisles expanded it, as in the great hypostyle hall at Karnak. It formed a monumental reception hall for the king and the sacred barges, which paused here before crossing the wide courtyard leading to the inner temple. The square open court with its double rows of well-proportioned papyrus-bundle columns merges on the south into the main entrance hall having columns of the same form. Crossing the "hall of offerings" one enters the barge sanctuary which, built within an ambulatory, is distinguished as an independent structure by fillets at the corners and crowning concave cornices. The rearmost chambers of the temple are accessible only from the sides through a transverse columned hall. They consist of a row of three chapels, the one in the centre being the holy of holies where the cult image of the sacred triad stood on a pedestal. In front of Amenhotep III's long entrance passage Ramesses II added the already mentioned spacious court; its entrance, on the north, is guarded by a pylon and obelisks, and the facade faces toward Karnak, linked by an avenue of sphinxes with Amon's main sanctuary. For the meaning of terms, see: Architecture Glossary. In addition to the temples of Karnak and Luxor on the east bank of the Nile at Thebes, there is on the west bank a small but important sanctuary at Medinet Habu, south of the original city limits. As the "true centre of primordial creation" this little temple could claim to be one of the holiest places of the holiest places of Thebes. Hatshepsut began its construction, over an older sanctuary, and it was revised and completed by her successor Tuthmosis III. The elongated rectangular building, whose ground plan is also recognizable in sanctuaries elsewhere, has rounded moldings at the four corners and is crowned above an upper encircling molding by a concave cornice. The whole stands on a moderately high podium reached by a small flight of steps on the east front. A canal branching from the Nile probably ended in front of the temple forecourt. The building is divided into two different areas. In front of the customary sanctuary is a barge chapel of the "baldachin temple" type with pillars on three sides and waist-high walls between them; in the middle stands a long shrine for Amon's barge. Originally the ceiling of this shrine - evidently the archetypal sacred hut beneath an awning - was lower than the roof of the surrounding column structure. The rear part of the temple is enclosed by outer walls, and here the ceiling height is lower than in the front part. The structure contains several small chambers: on the central axis is a square room, the main chamber, for its ceiling is somewhat higher and has a light-slit directing a feeble beam of light onto a statuary group representing the god Amon and the king, of which remains have been preserved. The rooms lying south and west of the main chamber served the cult of Amon; the room on the north, accessible only from the barge chapel, served the cult of the king. This sanctuary on the "primeval hill of Djeme" (Thebes) maintained close relations with the temple of Luxor on the east bank. At the beginning of each decade Amon was transported by barge, from his "southern harem," across to the temple on the west side of the river to make offerings to the "primordial gods." In the Twentieth Dynasty Ramesses III chose the immediate vicinity of this hallowed place to build his huge mortuary temple. He enclosed the ancient sanctuary within the fortress-like walls of his own temple area. The cult was maintained into the Ptolemaic era and during all this time the small Eighteenth Dynasty temple remained substantially untouched. Late inscriptions refer to the sanctuary as the "tomb of the eight original gods and the primeval snake Kneph," and accordingly various additions were made in the Thirtieth Dynasty and under the Ptolemies: entrance buildings, a hypostyle hall, pylons, and a small pillared entrance hall where the processions were ceremonially received. For Thebes, the early 18th Dynasty was a genuinely creative period in architecture. The most important building of this period - surpassing all others in originality and boldness of conception, in the balance of its masses, in its climactic progress from entrance to holy of holies, and in wealth of statuary and reliefs - is the terraced temple of Queen Hatshepsut on the cliff valley at Deir el Bahari (the place takes its name from the Christian monastery called "northern monastery" that once nestled among the ruins). Hatshepsut has already been mentioned as a builder of the temple of Karnak. The temple at Deir el Bahari served not only for her own funerary cult and that of her father Tuthmosis I and of her husband Tuthmosis II, who died young, but was also dedicated to the cults of Amon, her divine begetter, and of other gods. In choosing the site the queen acknowledged the first political rise of Thebes in the Eleventh Dynasty, the proximity of Mentuhotep's mortuary temple, and the neighboring sanctuary of the goddess Hathor, guardian of the necropolis. The huge temple complex is the work of the architect Senmut, the queen's favorite, and it shows a solution that takes over from the earlier model only the outward-directed effect of its open galleries and additional influences from Twelfth Dynasty architecture of the Upper Egyptian nomarchs' tombs, with their numerous terraces clinging to the cliffs. All of those prototypes are wholly surpassed, and in the grandeur of the site, with its backdrop of majestic vertical cliffs, is proclaimed a totally new concept of the dignity of divine kingship. The long sphinx-lined causeway leads from the rim of the cultivated land to the entrance portal, flanked by trees. The court extended, as with Mentuhotep's mortuary temple immediately to the south, in its full width of over 300 feet right up to the sanctuary, which rises in two giant steps and facing colonnades to the cliffs behind. These cliffs, soaring 350 almost vertical feet to a pyramidal peak, assumed the role of the missing pyramid. Into the other side of this mass of rock, from a spur of the Valley of the Kings, was tunneled the shaft leading to the tomb chamber of the queen, a distance of several hundred yards. The broad court was planted with palm trees and grapevines. In front of the main structure ponds fringed with papyrus were laid out on either side of the centre axis. Central ramps lead to the first and second terraces, and the buttressing walls are faced with colonnades of square pillars. Those of the lower colonnade, closing the court on the west, are decorated with the "Horus name" of the queen; this motif is continued on a giant scale along the outside of the niched buttressing wall that supports the second terrace on the south. The lower colonnade terminates at north and south in huge Osiris statues of the queen. The architectural decoration of the lower-story structures proclaims the royal name; on the next level the holiness of the precinct correspondingly rises, and on the outside faces of the pillars of the second colonnade the queen is shown before Amon. The sphere of the gods has begun; the second colonnade ends at the south in the chapel of the goddess Hathor, at the north in that of Anubis, god of the dead. The Hathor chapel could also be reached by way of a separate ramp along the south buttressing wall. Its facade is formed by a row of square pillars between short end walls, identified as an independent building by its crowning cornice and rounded corner moldings. Inside, round columns with Hathor-head capitals divide the anteroom of the chapel into several aisles, and through the aisle between the central row of columns was accessible the holy of holies, carved out of the rock at the end. Even this rock-cut sanctuary of the goddess Hathor is identified as a separate building by the relief decoration on its entrance portal, in this case a tentlike Upper Egyptian shrine. The slender fluted supports with small Hathor-head capitals and apotropaic horns, which bear a flattened vaulted roof, and the decorative loops of the matting walls of a tent structure, recall a type similar to the dummy buildings in King Zoser's burial precinct. The Anubis chapel at the north end of the upper colonnade is also treated as an independent building. On the facade of the anteroom and within, the sixteen-sided fluted columns on low round bases stand out from the square pillars of the main colonnade. In this chapel, too, the holy of holies is carved out of the same cliffs; the walls and vaulted ceiling, as in all the rock-cut chambers, are faced with stone slabs and richly decorated with painted relief sculpture. The vault is painted with golden stars in a night-blue sky. See also: Egyptian Colour Palette. The curve of the vaulted ceilings, employed in Egyptian stone architecture since the Fifth Dynasty pyramids, was obtained by cutting off the projecting edges of layers of stone, and these ceilings seem to have signified the crossing over from this world to the next. Brick barrel vaults and domes over small square chambers were already familiar to the builders of the Fourth Dynasty, who used them in the annexes to stone mastabas. The segmental arch first appears in stone architecture in the eighth century BCE. But apart from its use in the inner chambers of sanctuaries in the specified Old Kingdom pyramid temples, and in the rock-cut chapels and a few other rare instances, the vault played no part in Egyptian sacred architecture; where it was used it could never be discerned from the outward appearance of a sacred building. At the northeast corner of the Anubis chapel the cliff makes a sharp turn forward and forms the northern boundary of the terrace. Here too a shallow colonnade makes a facing for the cliff wall. The second ramp leads to the uppermost terrace, the culmination of the sanctuary. A long solemn row of identical Osiris statues of the queen forms the facade fronting the square pillars of the main hall. In the centre of the facade a granite portal leads into a narrow open court that is ringed by deep colonnaded halls. Recent examinations of this structure, which is in an advanced state of ruin, indicate that the row of pillars bordering the court was somewhat raised above the others. Immediately to the north of this courtyard area is a small open court where the sun god was worshipped at a great open-air altar that faced the rising sun; across from this sun sanctuary, to the south, is a group of vaulted chambers for the funerary cult of the queen and her ancestors. The holy of holies, dedicated to the god Amon, was carved out of the western cliff, exactly on the main axis of the temple and reached from the central court. Originally there were two chambers, one behind the other, but under the Ptolemies a third was added for the worship of two great mortals: Imhotep, one of King Zoser's greatest architects, inventor of stone architecture and author of a treatise on the planning of temples; and Amenhotep, son of Hapu, the architect of Amehotep III. For their wisdom, these architects were worshipped as gods: Senmut, architect of the terraced temple and favourite of Queen Hatshepsut, was long forgotten. The terraced temple of Deir el Bahri is a remarkable example of the aesthetic adaptation of a building to its natural setting. Architecture, however, is always the product of a shaping intelligence and must assert its forms against the chaotic formlessness of nature. Small as compared with the towering crags against which it is built, Hatshepsut's temple occupies only the lower zone of the wall of cliffs. Yet the crisp horizontals of its terraces and the strict verticals of its colonnades differentiate it sharply from the rugged terrain, with which it is nonetheless intimately, though not visibly, connected by the sanctuaries hewn out of the living rock. The natural grandeur of the landscape has been incorporated with the temple's thematic function as the eternal seat of the godhead and as the burial place of the queen deep within the mountain. For building works in Ancient Greece, see: Greek Architecture (900-27 BCE). The principle for the planning of the national sanctuary of the universal god Amon-Ra at Karnak, at the beginning of the Eighteenth Dynasty, was based on the worship of the sun god in open courts guarded at front and back by pylons and obelisks, as exemplified by the scant remains of the temple at Heliopolis. This principle can be recognized in the ancient core of the Karnak temple complex, as well as in the later additions on the south and west. The perpetual renewal of the kingship through the jubilee festival had a close association with the sun god - already confirmed in the Fifth Dynasty sun sanctuary, in the rich relief cycles of a "jubilee chamber" south of the great obelisk; and the idea of legitimate dynastic continuity, in the sense of the renewed conception of kingship, provided the stimulus for continual expansion through developing, enlarging, and improving the efficacy of the national shrine. Thus, it was not in itself surprising that Amenhotep IV, successor of Amenhotep III, should have built, still under his original name, two separate temples for Ra-Harakhte, the sun god of Heliopolis, one east of Karnak, the other near Luxor. To judge from the partially cleared remains at Karnak - those at Luxor have not yet been excavated - these temples, too, appear to have consisted of large courts for the open-air worship of the day star. Amenhotep IV resided for about five years in the capital city of Thebes, before his personally propagated theology of the sun as "Aten" (the solar disk) took a turn so one-sided and so hostile to Amon that the king changed his own name from Amenhotep ("Amon is satisfied") to Akhenaten ("In the service of Aten"). He deserted Thebes, and banned and persecuted the cult of Amon. On virgin land in Middle Egypt, untrammeled by religious traditions of any kind - including any traditions of religious art - he founded his new capital, Akhetaten ("The horizon of Aten"), on the east bank of the Nile opposite the ancient site of Hermopolis. After a mere twelve years this royal residence and exclusive cult centre of the sole god proclaimed by the king fell into decay, following the collapse of the new belief and the king's death, and shortly it was razed with all its buildings and sanctuaries to obliterate all memory of the "heretic." Excavations at the site thus reveal little more than the foundations of the palaces, temples, and living quarters, whose original buildings have been to some extent reconstructed with the aid of contemporary reliefs discovered in the tombs nearby. Like the visage of the new god, the planning of his temples at Akhetaten can be linked with the Heliopolitan model. The common theme was an axial succession of pylon-fronted courts, where on innumerable altars in the open air the king and his family offered sacrifices to the sun. Statues of the king placed against pillars, as in the open areas of the temple of Karnak, stood around the courts as witnesses to his presence and to the perpetual renewal of his claim to kingship. The architects of the Amarna period consistently translated the religious ideas propounded by the king himself into a succession of new types of Egyptian sculpture as well as architectural forms. These include many appurtenances of the temples (whose thematic significance is still not clearly understood), the erection of columns in front of pylons to form vestibules flanking the entrances, and especially the temple gates to the sanctuaries. In the theology of the new sun cult, the display of the gloom of the Underworld had no longer a place, and now even shadow was to be shunned. The temple gates had lintels broken back in the middle and cropped on either side, so that the king could pass through in unbroken sunlight. Temple approaches continued to be treated in this way to the very end of Egyptian architecture; they made it possible to carry the emblems of the gods in procession into the interior of the temples without lowering them at the entrance. After the collapse of Amenhotep IV s religious reformation, Thebes ceased to be country's political capital; however, it remained the religious centre of the restored cult of Amon and, until the end of the New Kingdom, the burial place of the kings. The royal mortuary temples, the kings' "houses for millions of years," were ranged at the foot of the western hills, but the great experiment of Hatshepsut's terraced temple was nowhere adopted. Of the mortuary temples of the queen's immediate successors only that of Tuthmosis III has been thoroughly explored; although it is on a more modest scale, the two share certain features, for example, a Hathor chapel on the south side. From Amenhotep III's huge mortuary complex, all that remains are the enthroned colossi, sixty-five feet high and made of quartzite that the king's architect, Amenhotep, son of Hapu, ordered from the quarries near Heliopolis, some 300 miles north of Thebes. At one time they flanked the monumental entrance with its massive pylon towers. The later mortuary temples (insofar as they still stand) - of Sety I in the northern section of the necropolis, of Ramesses II (Ramesseum), and of Ramesses III at Medinet Habu - appear to have been planned according to the principle of successive spaces at the temple of Luxor. The temple is usually approached through two sets of pylons, each leading into a broad court. 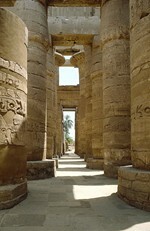 A vestibule on the west side of the second court leads to the hypostyle hall, which may be followed by various smaller pillared halls, and finally to the sanctuary. A separate chapel is reserved for the royal ancestors. The main sanctuary is solely for the cult of Amon and the king. The sun god also has a private chapel within the temple. Along the main axis the sequence of rooms is fixed; the side rooms and the arrangements at the rear of the temple follow the cult requirements imposed by the royal builder. In the back area of the Ramesseum huge brick-built store-rooms and offices for the administration of the temple have been preserved. Each chamber is covered by a barrel vault. After the end of the Eighteenth Dynasty, when Thebes was no longer a royal residence, a small palace was built on the south side of the first court of the ruler's mortuary temple for his occasional visits at the time of the great festivals. See also: Mesopotamian Art (c.4500-539 BCE). As cult places for the king and the gods, the mortuary temples were enclosed by high walls like the sanctuaries of the gods, with pylons forming the monumental front entrance. Ramesses III, developing the idea of the temple as a "fortress of the god" but certainly also mindful of the internal political difficulties of the Twentieth Dynasty, enclosed his funerary temple within double battlemented walls with massive tower-like fortress gates on east and west. In front of the east gate was a landing place for a canal leading from the Nile. Despite its fortified aspect, emphasized by the triumphal reliefs decorating the exterior, the upper chambers of the towers served as a "pleasure pavilion" for the king and his daughters, who are represented on the walls in reliefs of intimate scenes. For a comparison with contemporary funerary architecture from northern Europe, see: Newgrange Megalithic Tomb (c.3000 BCE) and its sister site Knowth Megalithic Tomb (c.2500 BCE). Egyptian architecture was chiefly preoccupied with the expression of eternal verities in material form, and the unusual temple of Sety I at Abydos illustrates this concern impressively. Abydos, the Upper Egyptian burial place of the early kings, had become in the Old Kingdom the home and sanctuary of the god Osiris. As vegetation god and divine ruler of the mythical past, Osiris was closely associated with the question of legitimate succession. In death the king suffered the fate of the god, to be summoned like him to rule over the world of the dead; the king's son and heir, identified with Osiris' son Horus, was the earthly ruler. Osiris, who came originally from the Delta (Busiris), had since the Old Kingdom taken over the seat of the god of the dead and the cult place of the "Foremost of the Westerners." His burial place was believed to have been found at Abydos in what was, in fact, the tomb of a First Dynasty king, and his death and return to life were dramatically celebrated in mystery plays enacted along the path that stretched from the city temple to the ancient royal necropolis. Abydos became a centre of pilgrimage; kings and private individuals built cenotaphs along the processional route of the mystery plays to ensure themselves a share in the blessings of this holy place. Like all the kings of the New Kingdom, Sety I had his burial place at Thebes, in the Valley of the Kings, although for strategic reasons he had established his residence at Kantir in the eastern Delta. His mortuary temple, in part well preserved, is the northernmost of those on the Theban west bank. In the Theban mortuary temples the worship of Amon-Ra as the universal god, and the dogma of his having fathered the king, had driven the older god Osiris into the background. The Nineteenth Dynasty first brought back shrines dedicated to the god of the dead, of vegetation, and of the rulers. Thus Sety I returned to earlier beliefs when at Abydos he built an important westward-oriented temple with two pylons, two courts, and an interior laid out according to the Theban plan. The aisles through a rising sequence of pillared and columned halls lead to seven chapels; the central one, dedicated to the national god Amon-Ra, is flanked by those of Ra-Harakhte and Osiris. The south wing contains the chapels of the king and the Memphite god Ptah, the north those of Isis and Horus, wife and son of Osiris. These elongated chapels, except for that of Osiris, had vaulted ceilings. A false door was represented in the westward-facing rear walls; false doors signified that behind them lay something involved in the cult. Only the Osiris chapel has a real door. This leads to chambers, dedicated to the cult of the god and his family, that form a narrow transept at the back of the seven chapels. Relief sculpture on the temple walls depicts the shrine, barge, and cult images, and the rites performed by the king; they are invaluable for recreating the former appearance of the temple and determining the functions of its various parts. The unusual annex on the south side of the main building contained chapels for other gods and the shrine of Sety's ancestors, who are listed by name, from Menes (Narmer), the founder of the kingdom, to the builder of the temple himself. The cenotaph of Sety I lies just to the southwest on the axis of the main temple; it is important for the architectural history of this complex. A structure sunk deep in the ground, its roof lay below the floor level of the main temple and its core was built entirely of massive granite blocks. Originally it was an isolated building; there is a separate access at the northeast end which, however, is interrupted by a deep shaft. The core of this cenotaph forms a rectangular chamber with a platform occupying the middle, surrounded by a moat that was filled with water by the annual Nile floods. On the short sides there are steps leading down to the level reached by the water. In the middle of the "island" two recesses for the sarcophagus and the canopic shrine are still visible. Two rows of stout granite pillars on the long sides support giant longitudinal architraves on which rested the ceiling blocks of the roof; these were probably corbeled toward the centre, forming a barrel vault above the centre of the platform. The walls surrounding this entire space contain niches whose significance is still uncertain. The use of undecorated massive granite blocks recalls the architecture of the Fourth Dynasty mortuary temples at Giza. The location and organization of this building leave no doubt that it was a cenotaph of the builder at the place most sacred to Osiris. The inner "island" symbolizes the "primeval hill" emerging from the waters of chaos to indicate the beginning of self-perpetuating creation. Simultaneously the island tomb equates the king with the god Osiris; according to ancient belief Osiris lay buried on an island which, on the one hand, represented the "pure" and "unapproachable," and on the other, symbolically linked his death and resurrection with the cyclical rise and fall of the Nile. Later representations show a sacred grove planted over Sety's subterranean building so that its shadow would envelop the soul of the dead king while its plants simultaneously honored Osiris as the creator of vegetation. See also: Greek art, a culture strongly influenced by Egyptian architecture and stone masonry and Roman Architecture (400 BCE - 400 CE). We gratefully acknowledge the use of material from the important work Ancient Architecture (first published 1972 by Electra, Milan): a fascinating study of building design in Ancient Egypt, not least due to its sensational photographs of the interior chambers and precinct hypostyles of famous Egyptian temples. We recommend this work to any student of the period.  For more about ancient architectural design, see: Homepage.